Dental Implants have changed the face of dentistry over the last 25 years.What are dental implants? What is the history of dental implants? And how are they used to replace missing teeth? This section will give you an overview of the topic of dental implants, to be followed by more detail in additional sections. As with most treatment procedures in dentistry today, dental implants not only involve scientific discovery, research and understanding, but also application in clinical practice. The practice of implant dentistry requires expertise in planning, surgery and tooth restoration; it is as much about art and experience as it is about science. This site will help provide you with the knowledge you need to make informed choices in consultation with your dental health professionals. Let’s start from the beginning: A dental implant is actually a replacement for the root or roots of a tooth. 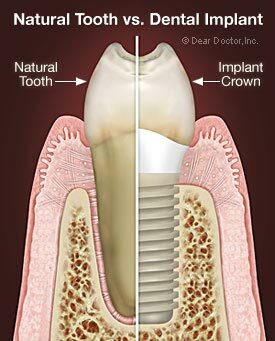 Like tooth roots, dental implants are secured in the jawbone and are not visible once surgically placed. They are used to secure crowns (the parts of teeth seen in the mouth), bridgework or dentures by a variety of means. They are made of titanium, which is lightweight, strong and biocompatible, which means that it is not rejected by the body. Titanium and titanium alloys are the most widely used metals in both dental and other bone implants, such as orthopedic joint replacements. Dental implants have the highest success rate of any implanted surgical device. Titanium’s special property of fusing to bone, called osseointegration (“osseo” – bone; “integration” – fusion or joining with), is the biological basis of dental implant success. That’s because when teeth are lost, the bone that supported those teeth is lost too. Placing dental implants stabilizes bone, preventing its loss. Along with replacing lost teeth, implants help maintain the jawbone’s shape and density. This means they also support the facial skeleton and, indirectly, the soft tissue structures — gum tissues, cheeks and lips. Dental implants help you eat, chew, smile, talk and look completely natural. This functionality imparts social, psychological and physical well-being.